OneRoster is the standard specification for securely sharing class rosters and related data between a student information system (SIS) and any other system, typically a content application or learning information system (LMS). The OneRoster standard supports spreadsheet-style (CSV) export-import as well as direct system exchanges using REST API’s. With OneRoster, schools pave the way for digital resources for teaching and learning and eliminate problems before they happen. Adopting the OneRoster standard allow schools to stop the error-prone burden of manually creating unique class roster data extracts for every digital text, web publisher and platform provider and duplicate data entry of grades. For more information see Real-World Scenarios. Teachers and technical administrators setting up and managing the tools and technologies in schools and districts. Teachers and administrators can save massive amounts of time and avoid countless issues using OneRoster. With accurate rosters, publishers prevent missing student accounts and incorrect class groups, which are major stumbling blocks to using online resources in the classroom. What are the specification's features? 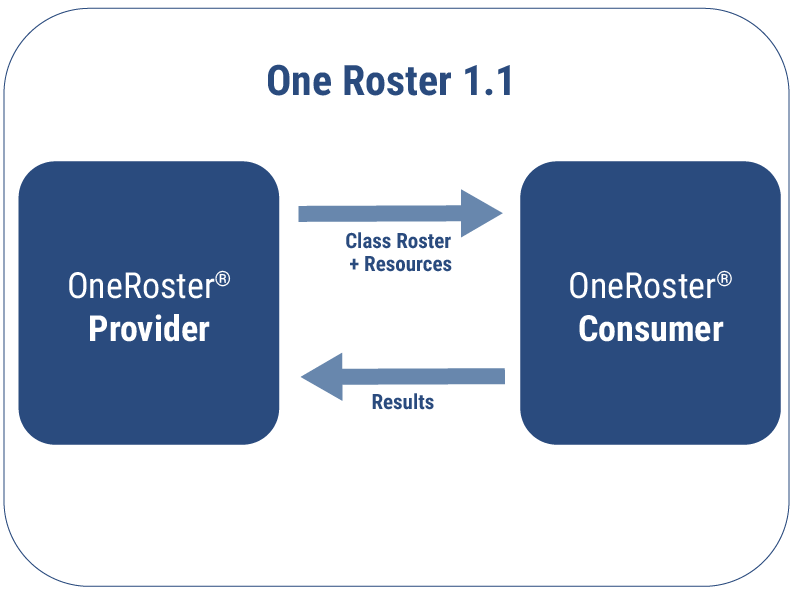 OneRoster defines two roles, a Provider and a Consumer. Technical administrators or other users of the CSV will export from the Provider system such as a student information system and import to a consumer system, such as an LMS or a digital text. REST API-based products adopt the same concepts but users are not handling files directly since the exchange is system-to-system. OneRoster 1.1 is a major upgrade to OneRoster 1.0 and is based on the IMS Learning Information Services (LIS) information model. What additional information is important about OneRoster Service 1.0? When selecting products it is very important to understand what OneRoster product type you are considering purchasing. Will the product be a OneRoster Provider or a OneRoster Consumer? Or is the product performing an Aggregator service, which is a Consumer of data from one system and Provider of that data to another system? An Aggregator service usually performs additional value-added services to help make the onboarding and enrollment of students in multiple platforms easier and more efficient. Because of their intermediary role, to be compliant, Aggregator product types must be certified as both Consumers and Providers.